Researchers at Oxford University and the Swiss agricultural research institute, Agroscope, have created the most comprehensive database yet on the environmental impacts of nearly 40,000 farms, and 1,600 processors, packaging types, and retailers. This allows them to assess how different production practices and geographies lead to different environmental impacts for 40 major foods. They found large differences in environmental impact between producers of the same product. High-impact beef producers create 105kg of CO2 equivalents and use 370m2 of land per 100 grams of protein, a huge 12 and 50 times greater than low-impact beef producers. Low-impact beef producers then use 36 times more land and create 6 times more emissions than peas. Aquaculture, assumed to create relatively little emissions, can emit more methane, and create more greenhouse gases than cows per kilogram of liveweight. One pint of beer, for example, can create 3 times more emissions and use 4 times more land than another. This variation in impacts is observed across all five indicators they assess, including water use, eutrophication, and acidification. "Two things that look the same in the shops can have very different impacts on the planet. We currently don't know this when we make choices about what to eat. Further, this variability isn't fully recognised in strategies and policy aimed at reducing the impacts of farmers." says Joseph Poore from the Department of Zoology and the School of Geography and Environment. A small number of producers create much of the impact. Just 15% of beef production creates ~1.3 billion tonnes of CO2 equivalents and uses ~950 million hectares of land. Across all products, 25% of producers contribute on average 53% of each product's environmental impacts. This variation and skew highlights potential to reduce impacts and enhance productivity in the food system. "Food production creates immense environmental burdens, but these are not a necessary consequence of our needs. They can be significantly reduced by changing how we produce and what we consume" says Joseph Poore. "One of the key challenges is finding solutions that are effective across the millions of diverse producers unique to agriculture. An approach to reduce environmental impacts or enhance productivity that is effective for one producer can be ineffective or create trade-offs for another. This is a sector where we require many different solutions delivered to many millions of different producers." For producers, the researchers present evidence in favour of using new technology. This technology often works on mobile devices, taking information on inputs, outputs, climate, and soil, to quantify environmental impacts. The technology then provides recommendations on how to reduce these impacts and increase productivity. However, producers have limits on how far they can reduce their impacts. Specifically, the researchers found that the variability in the food system fails to translate into animal products with lower impacts than vegetable equivalents. For example, a low-impact (10th percentile) litre of cow's milk uses almost two times as much land and creates almost double the emissions as an average litre of soymilk. Diet change, therefore, delivers greater environmental benefits than purchasing sustainable meat or dairy. Further, without major changes in technology that disproportionately target animal products, the researchers show that animal product-free diets are likely to deliver greater environmental benefits than changing production practices both today and in the future. Specifically, plant-based diets reduce food's emissions by up to 73% depending where you live. Staggeringly, global agricultural land would also be reduced by ~3.1 billion hectares (76%). "This would take pressure off the world's tropical forests and release land back to nature" says Joseph Poore. The researchers show that we can use take advantage of variable environmental impacts to access a second scenario. 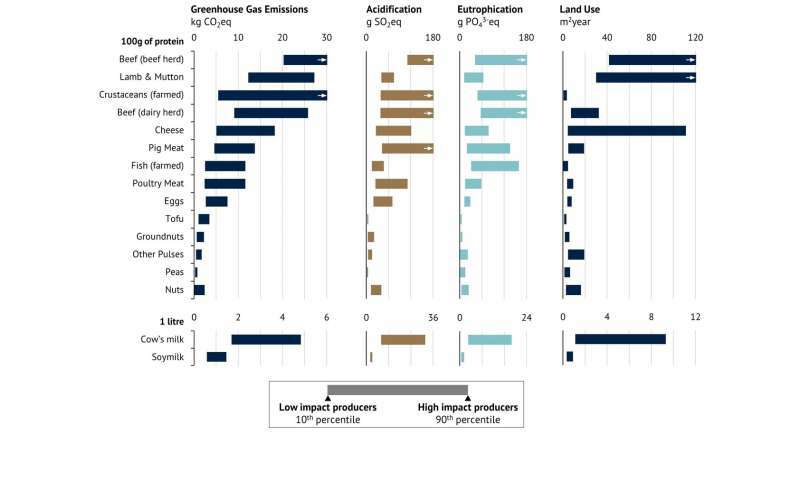 Reducing consumption of animal products by 50% by avoiding the highest-impact producers achieves 73% of the previous scenarios GHG emission reduction for example. Further, lowering consumption of discretionary products (oils, alcohol, sugar, and stimulants) by 20% by avoiding high-impact producers reduces the greenhouse gas emissions of these products by 43%. This creates a multiplier effect, where small behavioural changes have large consequences for the environment. However, this scenario requires communicating producer (not just product) environmental impacts to consumers. This could be through environmental labels in combination with taxes and subsidies. "We need to find ways to slightly change the conditions so it's better for producers and consumers to act in favour of the environment" says Joseph Poore. "Environmental labels and financial incentives would support more sustainable consumption, while creating a positive loop: Farmers would need to monitor their impacts, encouraging better decision making; and communicate their impacts to suppliers, encouraging better sourcing". Is your Easter egg bad for the environment? Hmmmmmmm -- I'm "shocked" that the Seafood Industry Research Fund decided that vegetarian and vegan diets are environmentally worse than disgusting aquaculture and pillaging ocean wildlife. Soooooo surprising. Ugh. Industry pseudo-science.